Born in 1983, Gary originally started training with his Mum, Sue, under the tutelage of Si Fu Phillip Barnes. They joined the Kwoon as Gary was being bullied at school. Within the first few weeks, Gary learnt the skills to keep him safe from physical attack, but preferred not to hit back. This in the Art of Chu’an Fa is not necessarily a bad thing as the Art allows you to redirect the opponents strike and weight to allow you to defend without the need to strike. Six weeks after Sue and Gary starting training, Gary’s Dad and Sue’s husband Mick also joined the Kwoon. Over the coming years, the Henshaw family trained heavily under the tutelage of Phillip Barnes. In 1995, Gary and Sue graded and earned the grade of 1st Duan black sash, a documented world first of a mother and son simultaneously grading to 1st Duan. In 1997 Sue and Mick took over the running of the Lung Kwoon as Si Fu Phillip Barnes moved to Leeds as his employer relocated him. Around the same time, Sue stepped away from Martial Arts due to health reasons. Gary and Mick began travelling to visit other clubs regularly and to take an active part within the International Budo Association (IBA) and the Zanshin Martial Arts Association (ZMA). On the 11th of November 1998 Gary and Mick attended a seminar in London held by Professor Rick Clarke, 8th Dan and founder of Ao Denkou Kai Jitsu. This introduced them to the arts of Atemi Ju-Jitsu and vital points. 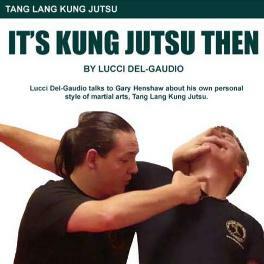 This four hour seminar changed the way Gary and his father looked at Martial Arts forever and is a defining moment in the evolution of Tang Lang Kung Jutsu. Following that faithful day Gary and Mick began training heavily in Ju-Jitsu, Atemi-Jutsu and Kobu-Jutsu with Phillip Barnes under the tutelage of Phil Milner of the International Budo Association. He has also trained in Judo, Systema, Hojo-Jutsu and submission wrestling, and regularly helps at other Instructors martial arts clubs where his son Ryan trains in kickboxing. Advanced Child and Vulnerable Adult Safeguarding Trainer with STC.